I made this soup last month just before traveling to L.A. and forgot to post the recipe until now. This soup was so delicious that I can’t recommend it enough. Please note: the pictures shown seem to hide the fact that this is a soup. There is broth under all of that rice and chicken goodness, I promise! Sprinkle chicken evenly with jerk seasoning. Heat oil over medium-high heat in a small skillet. Cook onion and garlic for about 3 minutes, stirring occasionally, until tender. Spoon onion and garlic to the slow cooker. Add chicken to the slow cooker. Pour the broth, adobo sauce, beans, coconut milk, salt and pepper over the chicken. Cover; cook on Low for 4-6 hours. Remove chicken from slow cooker to plate. Shred/cut chicken into bite-sized pieces and then return chicken to slow cooker. Stir in lime juice and chopped cilantro. 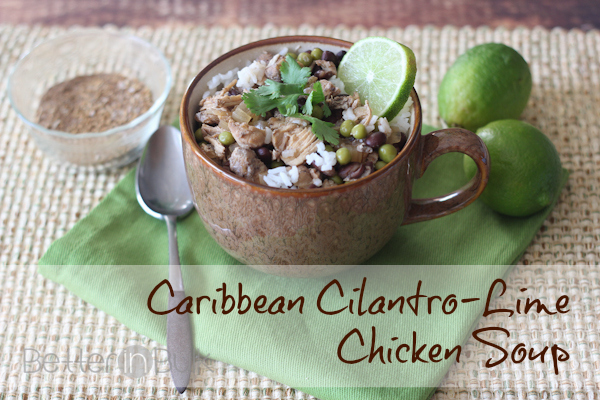 To serve, place a scoop of rice in a bowl and pour soup over rice; garnish with cilantro and lime wedges. Modified from a recipe found on Betty Crocker. I’m teaming up once again with From Val’s Kitchen and This Mama Loves for our weekly recipe linky. Please post the direct link to your recipe (not your blog URL) and the name of your recipe below. Then be sure to visit again next Monday for a new recipe and another chance to link up! © 2013 – 2016, Food Fun Family. All rights reserved. This looks so delicious. I love soups that have lots of “stuff” in them! Looks delicious! 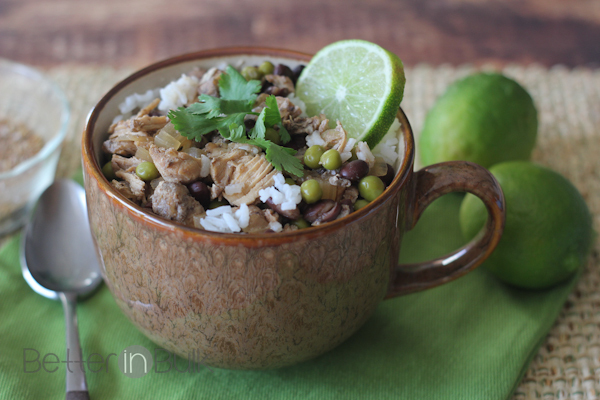 We love lime-based stews! Thanks for sharing the recipe! I’m always trying to find new chicken recipes. Soup is the best thing to eat during the cold winter months! I’ll have to try this recipe!